Tokyo Ryokan is located in Asakusa, one of the Shi-ta-ma-chi towns of Tokyo, where you can let yourself be enchanted by the air of temple incense. As a contrast to the neon lights of Tokyo's many nightlife attractions, in this Shita-machi you can experience the atmosphere of Edo, the old Tokyo. It is 4 min. walk to nearest station Tawaramachi (G18) on Tokyo Metro Ginza Line. Asakusa station is about 8 min. walk. Asakusa is located on the north-east of central Tokyo, easy access to many popular sightseeing spots like Tokyo Skytree (4 min. ), Ueno (3 min. ), Akihabara (5 min. ), Tokyo main station (15 min. ), Ginza (16 min. ), Roppongi (20 min. ), Shinjuku (25 min. ), Harajuku (25 min. ), Shibuya (26 min. ), and you can also take ferry from Sumida River Park to the Tokyo Bay area, for instance, to visit Odaiba and Hamarikyu. Nikko can be reached by direct train on Tobu Skytree Line. There are also direct connections both from/to Narita Airport and Haneda Airport. Here's the list of short and nice walk distance from Tokyo Ryokan including several must-places of downtown Tokyo. For more detailed lists, please visit Official Sightseeing Spots Link. Height of 634m, just completed in 2012, new Tokyo Tower. Tembo Deck (350m), Tembo Galleria (450m) and Sola-machi (Sky-town) has become the must of Japan. 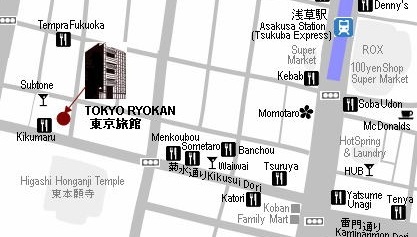 Tokyo Ryokan is located within nice local walking distance, and between Ueno and Asakusa . From Asakusa, it is the other side of the river, very oishii place to eat (^^) as well. Kaminari-mon (Thunder-gate), the outer gate of the Sensouji Temple and symbol of Asakusa, which was dedicated by Mr. Panasonic (Matsushita san). Entrepreneur wanna-be touches the dragon ball decorated underneath the lantern. Starting from this gate, walk north bound through Nakamise, you'll reach to the main hall of Sensouji Temple. A shopping street of 260m, 88 shops, north-south. Edo-style crafts is sold here. Worth roaming in the night time to see Japanese paintings on each shutter. Perpendicularly crossing shopping street is called Shin-Nakamise, also worth to explore 110 shops, east-west. Off these streets are also good to explore to satisfy your tummy. The headquater of Asahi Breweries Ltd. Jug of beer (see the exterior of the building as your beer bubble? ), giant golden flame (please ask Philippe Starck san "c'est quoi? "), and newest icon, Tokyo Skytree can be in one shot from Asakusa bridge on Sumida river (Sumida gawa). Direct water bus Himiko and Hotaluna and Emeraldas connect Asakusa and Odaiba. All 3 ferries are designed by one of the famous manga author (999, three-nine). Hamarikyu Japanese Garden and Ryogoku Sumo Kokugikan have link with another type of ferries. Another water bus is available at www.tokyo-park.or.jp/waterbus/course/course.html . Tokyo's wholesale restaurant supplies area. Plastic Sushi Sample, Knife, Nambu Tekki, Yunomi (Youknowme? ), Kyusu, Lantern Chochin, Noren, Ohashi, Pottery, China, Japan and more. It is less than 1km long street, but it takes forever. You cannot avoid window-shopping and windows-hopping? All about Asakusa with SGG, foreign currency exchange (Sat.Sun.Holiday as well), free internet, free WiFi from 09:00AM to 20:00 (8PM). 8th floor has great view of Skytree, Sumida River and Sensouji Temple. Established in 1872, the oldest and largest museum in Japan. It exhibits fine Japanese artifacts including pre-historical ones plus some from all over Asia. Nearby the building has also Tokyo Metropolitan Art Museum, National Museum of Nature and Science, National Museum of Western Art. Japan's first park with a zoo, art museum, national museum, ponds, shrines, temples, cherry blossoms and lotus flowers. It is also famous for the battlefield of Meiji new government and Edo samurai. Great place to chill-out for all seasons with any weather. YaNeSen (Yanaka-Nezu-Sendagi) is located just north of the park. This busy market streets from JR Ueno station to JR Okachimachi station are always crowded with clothes, cosmetics, bags, fish, spices, tea, seaweeds nori, tachinomi standing izakaya, niki no okashi (junk food department store), t-shirts, golf, Takeya (the purple buildings) and more. Founded in 1874. Many celebrities including Yokoyama Taikan, Tokugawa Yoshinobu, Shibusawa Eiichi, Hatoyama Ichiro, Dewanoumi 19th Yokozuna and more are sleeping in peace here. It is also known as cats' heaven. Nippori Sen-i-gai or Fabric town is another side of JR train railways. 3 out of 6 tournaments are held here in Ryogoku, Tokyo, nice riverside walk distance from Asakusa. During the tournament, best match can be seen between 17:00 - 18:00. In the morning or early afternoon, you may explore Kyu Yasuda Teien, Edo Tokyo Museum, Ireido Shinsai Kinendo, Honganji Jikoin as well as Akihabara. The half bridge of Nihonbashi (wooden Japan-Bridge),Senryobako (box of oban or ohban and koban),Nagaya, Shibaigoya (koya), Echigoya in EdoZone. Asakusa Ryounkaku and more in ModernTokyo Zone. Sumo tournament stadium is justnext to this museum. Wood block printing,Katsushika Hokusai Museum is short walk away. The world famous electric city together with Manga, Japanimation, maid, maid cafe, Hokoten or Hokosha Tengoku, Sega game arcade, video arcade, amusement arcade, print club or plicla, AKB48, yes, world Mecca of the GEEK/NURD (^^) please do not miss all floors of Yodobashi Akiba. It is situated underneath the elevated railway tracks between Akihabara and Okachimachi (just south of Ueno). A group of craftsmen who display their advanced, high quality skills in galleries, studios, cafes, shops, and more. Regular workshops are held to invite visitors to try their hands making masterpieces. 3331 is not far at all. Built in Edo era (even before the great Kanto earthquake), but most parts had been renovated by local artists. Now active in place for relax with international gallery. Is it only the Italian machine magic? No. Best beans with perfect roast and right milk, every factor beautifully plays each role, then such aroma and art and the masterpiece appears. One of the best Caffe Latte in Tokyo (no exaggeration). Well managed by interior design company. Very cozy and relax for locals. Cafe time menu has super value starting at 600yen (08:30-18:00), and night time turns into low-keyed bar, very chic. Black coffee drips one-by-one. Popular coffee bean from Kobe is the reason of aroma. Yamazaki, Chichibu, Hakushu and more. One of the typical Okonomiyaki restaurant in Tokyo. Homely homey and traditional style house. Guests cook on your teppan-yaki table. Are you a good chef yourself? Located between Tokyo Ryokan and Taito Ryokan. Right next to Campion Ale. Just came back from Jazzy New York after 33 years of his serving Japanese VIPs when the couple visit the Apple City. Lunch has good deal, dinner has good music. Non-smoking. Vegetarian welcome. Ramen, SuanLaMian, Tanmen, GomaTantan, Gyoza, Fried Rice, ButaDon, Teishoku (set menu), all tastes good, actually one of the best ramen shops in Asakusa (serving more than 50 years). Vegetarian welcome. Anago Bo-Zushi (Sushi) and imosui are the must. Trained well in famous restaurant in Kyoto, young owner started his first shop here in Asakusa 10 years ago. Only 6 seats, all facing counter like izakaya style. Everyday, Neta (ingredient) comes from Tsukiji fish market. Very fresh and good price. Lunch has special deal, Dinner sits in front of chef is entertain. Better to sit at counter seat so that you can enjoy chef's talented hands right in front of you. Bar, Izakaya, Sake. Very small family style Izakaya with maximum 10 people. English menu is available. Right next to Sometaro. Vegetarian welcome. English style brewpub, all brewed right behind the bar counter. Tried Asahi? Sapporo? Kirin? Suntory? this comfy tavern becomes a must-visit in Asakusa for every beer-lovers. You will be lucky to be able to taste all 5 varieties of ale (because usually one or two of them got sold-out everyday). Meat pies are the best in town. Udon, Soba, Katsudon, Oyakodon, Curry Namban, and more, all is cooked and served by local family of Asakusa. This is truly the authentic Japanese style. No frill, very simple, and so good, just like mother's kitchen. The shop name says everything. Lemon Meringue Pie as well as Chocolate Cake are the best in town. Everyday sold-out, so better hurry. Nothing comes from can (not canned food like others) but ingredients are limited-time-consumed, cooked by owner's hands. Eggplant Beef Curry has taste, too. Next to Tokyo Ryokan.